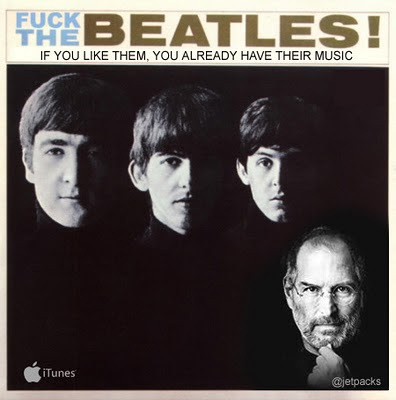 There has been much hype around The Beatles allowing their music to be sold through iTunes. This fab remake of one of the Fab Four's album covers sums up the whole situation quite nicely. It's by my man Jetpacks. Of course it's very easy for us all to knock the whole Beatles/iTunes thing but within 24 hours of going on sale Beatles songs occupied 15% of iTunes UK's top 200.